The word 'Lauki' is always related to 'bland' despite its health benefits. It is good for digestion and relieves constipation. 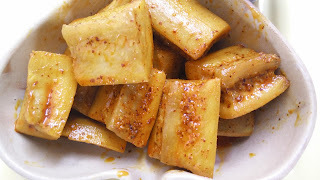 To give a little twist to normal lauki vegetable, prepare it like pickle. Immerse cut pcs of Lauki in boiling water in which turmeric powder is already added. Keep it immersed for 5-10 min and then remove excess water and dry the pcs for some time.